Be the first to share your favorite memory, photo or story of Richard A.. This memorial page is dedicated for family, friends and future generations to celebrate the life of their loved one. Richard A. 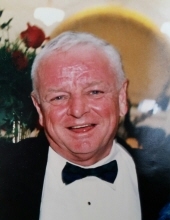 “Whitey” King, age 78, of Oak Brook, IL and Sarasota, FL; beloved husband of Molly, nee Hurley; loving father of Kelly Ann King-Taylor and father-in-law of Jay Taylor; cherished grandpadge of Clarke Frances; dear son of the late William J. King Sr. and the late Margaret Patricia King; fond brother of James (Martica) King, the late William J. (Dee) King Jr., the late Robert (the late Jane) King, the late Michael King; brother-in-law of Honey (George Gfroerer) Hurley and Lawrence G. (Mary Jo) Martin; uncle of many nieces and nephews. Whitey was a former director and long-time member of the Chicago Board of Trade. Visitation Thursday, January 31st, 3:00 p.m. until 8:00 p.m. at Drechsler, Brown & Williams Funeral Home, 203 S. Marion St., Oak Park. Prayers Friday, February 1st, 9:45 a.m. from the funeral home to St. Luke Church for Mass at 10:30 a.m. Private interment All Saints Cemetery, Des Plaines. In lieu of flowers, memorials to The Roskamp Institute, 2040 Whitfield Ave., Sarasota, FL 34243 or The Well of Mercy, 6339 N. Fairfield Ave., Chicago, IL 60659 are appreciated. To send flowers or a remembrance gift to the family of Richard A. "Whitey" King, please visit our Tribute Store. "Email Address" would like to share the life celebration of Richard A. "Whitey" King. Click on the "link" to go to share a favorite memory or leave a condolence message for the family.